Powers/Abilities: Anthony Sloan had mutant-based pyrokinetic powers. He could put things on fire simply by looking at them. 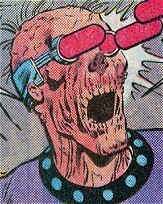 He also used some special glasses which could concentrate his pyrokinetic gaze into pulses of burning heat (see comments). Weaknesses: The more he used his power, the greater the pain in his head caused by a sort of feedback which caused him to lose control over his power. He also was insane. (Power Man & Iron Fist#108 (fb)) - Anthony Sloan's mother left the family because of her husband's extremist religious convictions. They lived in Divinity. When Anthony and his sister Rebecca reached puberty, their bodies developed special mutant powers; Anthony could put things on fire. Their father, a preacher, did not allow them to use their powers because he considered them as an evil gift and punished them harshly if they showed any use of their power, no matter how minimal. 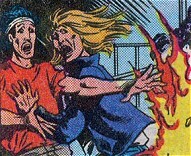 However, one day, Anthony saw his father hurting his sister, and in an enraged attempt to protect her, used his pyrokinetic powers. The flame enveloped his father, killing him and burning Anthony, seriously wounding him. It took almost a year for him to recover from these injuries, during which Rebecca helped and cared for her brother, but Anthony's guilt and pain drove him insane. Anthony, now mad, adopted his father's precepts. When he was able to walk again, "Slime Street," which his father had claimed to be the source of the evil and decadence in modern society, had now become his obsession. (Power Man & Iron Fist#108) - One day, Anthony, decided to cleanse "Slime Street." He left Divinity to reach the "Slime" Times Square in New York. The bus left him at the Port Authority of New York, where he was noticed by Trevor West. Anthony reached the GEM Theater where he found a couple of "maggot scums" to punish. 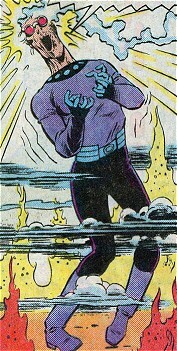 His powers put the theater on fire and attracted Power Man and Iron Fist. Naming himself Firebolt, Anthony fought Iron Fist but had to withdraw when his powers generated feedback, causing him great pain. 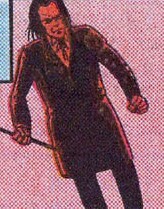 Firebolt was helped into hiding by Phil Loman and was thus able to evade Luke Cage's pursuit. (Power Man & Iron Fist#108 - BTS) - Loman tricked Anthony, convincing him to "cleanse" only some particular buildings, and Anthony followed his suggestions. Loman was actually using Firebolt to put his own properties on fire in order to collect the insurance money. (Power Man & Iron Fist#108) - When Firebolt attacked the State Hotel, he was tackled by Iron Fist, whose research had found out Loman's plans. Firebolt fired a deadly beam at Iron Fist when Luke Cage intervened just in time to distract him. Cage was able to resist the blast of Firebolt's burning gaze. Firebolt increased the intensity of his optical rays but used too much power and the pain overwhelmed him again. He lost control of his powers, which turned back on him magnified 10 times, with the resulting explosion causing half a building to collapse. Both Firebolt and Phil Loman seemingly died under the debris. (Civil War: Battle Damage Report) - Tony Stark considered Firebolt as a potential Initiative recruit. Comments: Created by Archie Goodwin (plot), Jim Owsley (script), Greg LaRoque (pencils) and Andy Mushinsly (inks). It is unknown where Anthony Sloan received the special lenses/glasses and his high technology-like costume. His thoughts and words were rather illogical, as if he lived in a different world, so it is also probable that both the costume and the glasses had been assembled by him and had no special properties, and that the "pulse effect" of his gaze was actually caused by his eyes. or any other "Fire-" or "Sloan" characters. or any other "Trevor" or "West" characters. or any other "Mouse" characters. any other "Phil" or "Loman" characters. any other "Martin" or "Fine" characters. The Merchants Association was a group of business people who had legitimate activities in the Times Square area. The identified members were Martin Fine, Max Griffith (uncle of D.W. Griffith who ran the GEM Theater where Cage lived), Phil Loman and other business people. After the GEM burned as Firebolt's first cleansing, Fine and the other merchants proposed to D.W. to create a joint venture to hire Power Man and Iron Fist to capture Firebolt before he could damage some legitimate businesses while "cleansing" the area. However, their debating didn't last long because of Firebolt's attack on Mousey's video game hall. Phil Loman was a businessman in the Times Square area. When Loman saw what Firebolt was able to do, he conceived a plan to cheat his insurance companies and his tenants. He helped Firebolt to escape to Power Man's pursuit and hid him. He then used Firebolt's obsession against Times Square to drive him to destroy his own properties so that he could collect the insurance money. Loman faked his own concern, joining the 42nd Street Merchants Association, which wanted to hire Power Man and Iron Fist to stop Firebolt. Instead, Loman helped Firebolt burn Mousey's video game hall and Jollie's Massage Parlor, but Iron Fist had guessed the connection between the two places. When Firebolt set the State Hotel ablaze and was trying to kill Iron Fist, scared from Firebolt's frenzy, Loman understood that he had gone too far. When the building collapsed, Loman was killed by the hotel sign falling and died. Mousey was one of Phil Loman's tenants in Times Square. His cover business was a video game hall, but his place was actually a hangout for criminal elements. Firebolt, guided by Loman, "cleansed" and burned his shop. Iron Fist and Luke Cage arrived too late and found only debris and ashes. Anthony's family lived in the small town of Divinity. Father Sloan, Anthony's father, was a preacher who had strong religious convictions that were so strong that he drove his wife away. His prayers were mostly directed against the evil in the world, which he imagined manifesting mainly in "Slime Street", actually Times Square in New York. Father Sloan was so blinded by his convictions that, when he discovered his children's mutant powers, claimed that they were satanic creations. He punished his children harshly when they displayed even the barest traces of their "evil" power. But one time, Rebecca tried to warn him because she had foreseen his death. He became enraged to the point that he was seriously harming her. At that moment, Anthony intervened to protect his sister and used his still untamed power against his father, killing him. Rebecca was Anthony's sister. She was also a mutant and had the power to foresee future events. Anthony and Rebecca lived in Divinity with their father, a preacher who saw their children's powers as satanic and punished them if they tried to use their powers. However, Rebecca foresaw her father's death and she felt compelled to tell her father. He was so enraged that she had used her powers that he hurt Rebecca just as Anthony arrived. Trying to protect his sister, Anthony used his power against his father, but his anger was so great that he killed his father and also burned himself. Rebecca stood by Anthony for a year while his body recovered. When Anthony fled and started his crusade to cleansing "Slime Street," Rebecca tried to reach him in New York. When she arrived at the NY Port Authority and looked at Power Man, a vision overwhelmed her regarding Power Man, Iron Fist and his brother's death. Luke Cage helped her and together they reached the State Hotel, where Iron Fist and Firebolt were still fighting. Her brother died when the building collapsed, as Rebecca had foreseen. Snake and his friend were two drug dealers operating on the street. Snake and his friend were in the GEM Theater counting the money they had collected after their daily "stash" selling. Unfortunately for them, Anthony Sloan spotted and approached them. Snake was ready to use his wooden stick but, apparently, it suddenly caught fire for no reason. When Snake and his pal looked at Anthony's face, they understood that something was going wrong. They were horrified as Anthony started to pyrokinetically set the theater on fire. Trevor West was a youthful small-time criminal who practiced his "business" in the New York Port Authority. Trevor was at the Port Authority when Anthony Sloan reached New York, and noticed him because of his ugly appearance. The day after, Trevor was minding his business involving the bag of a beautiful lady, but was interrupted by Luke Cage who gently forced him to remember what had happened the night before. Some moments later, Luke Cage was recognized by Rebecca Sloan and Trevor fled.